Well, where to start…. 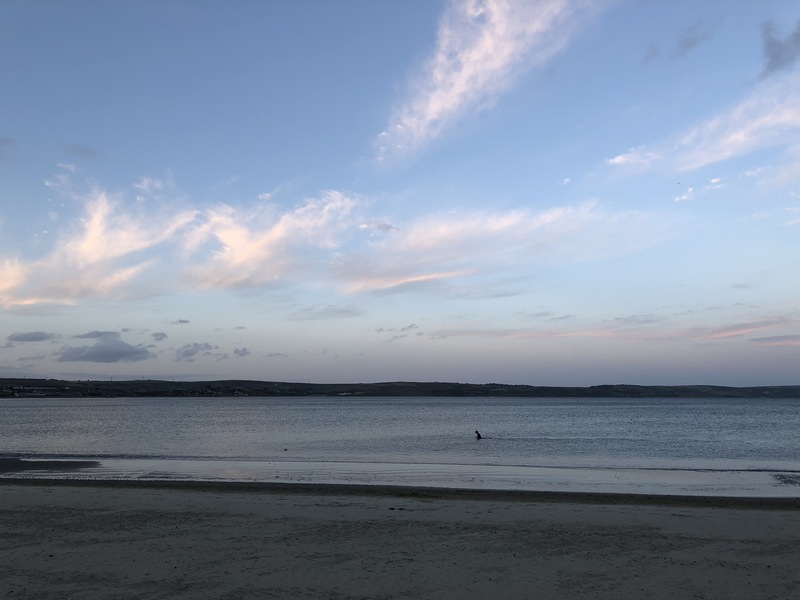 I came back to Weymouth for two reasons. Firstly I didn’t have a great swim last year and wanted to conquer that. Secondly, after a poor performance at Staffs I wanted to get a decent race under my belt. Despite the poor start to the season, the mid part had actually gone well, aside from another niggle that I was carrying in to this event. I had been swimming very well and my cycling was improving greatly too. 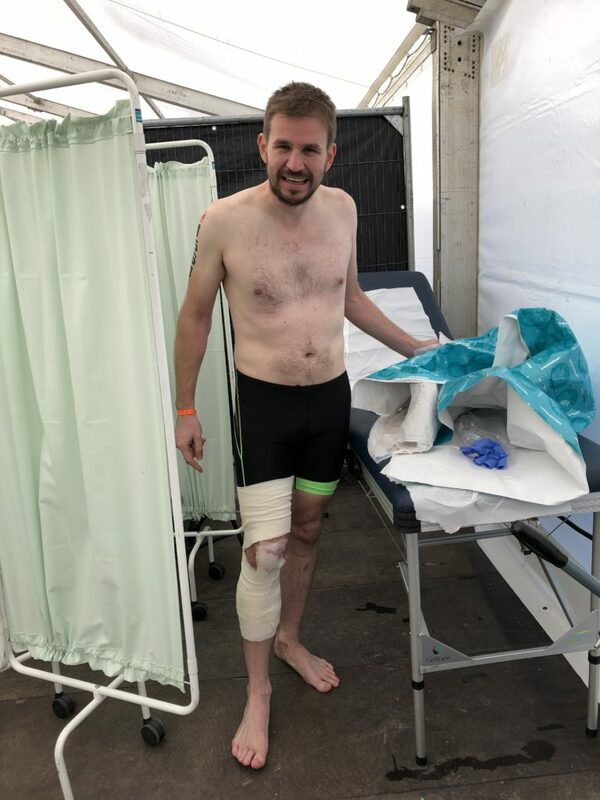 I’d completed a 110 mile hilly ride at the Mad Summer Sportive a few weeks before and despite sustaining a knee injury early on, had performed well. Side note here, it’s a great event, really well organised, very challenging ride but you set the limit by deciding how many steep hills you do! Highly recommended!! I wasn’t hopeful of qualifying for the World Championship as I was a 39 year old in a 35-39 age group… but practice is good! Typical of my luck, we’ve had an amazing summer, but somehow, of all the weekends a couple of tropical storms decided to converge and head over this way. Great. The weather was warm and sunny up to the Friday and then again from the Monday. The weekend however was a 100% chance of rain throughout and a drop from around 15 degrees to 7 or below for the times during the race. Ironman had even sent an email a few days before advising people to think carefully about their choice of wheels and clothing! As you can see from the above. Things definitely changed!! After all of that we had an early dinner at the wonderful Dorset Burger Company – carb loading with style! Then back to the hotel for an early night. I was a bit puzzled as to how I was getting to the race the next morning as Hayley wasn’t keen on the 4am start. The race briefing spoke of the park and ride which was very close to our hotel but online information suggested otherwise. So I was planning on walking the 2 miles. I got up bright and early at 4:30am. Shoved some porridge down my throat and sorted all of my nutrition. 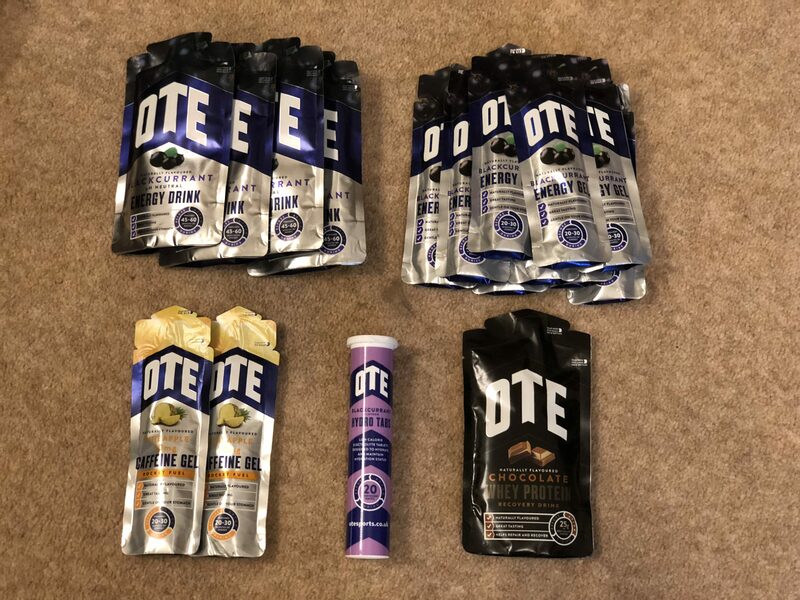 After much trialling I’ve pretty much settled on OTE as my nutrition of choice. It seems to agree with me, tastes good and isn’t completely chock full of rubbish like some of the others. I’d been using my early season races to fine tune my nutrition and following some advice from Alistair Brownlee (probably knows a thing or two) was taking more than usual for this race. As I was setting off for my walk I was fortunate enough to bump into a family who were taking their son down, they very kindly offered me and another athlete a lift to the start. Whilst this was much appreciated, it did mean I was rather early, arriving in transition at 5:15am with very little to do, other than put my nutrition on my bike and get changed! 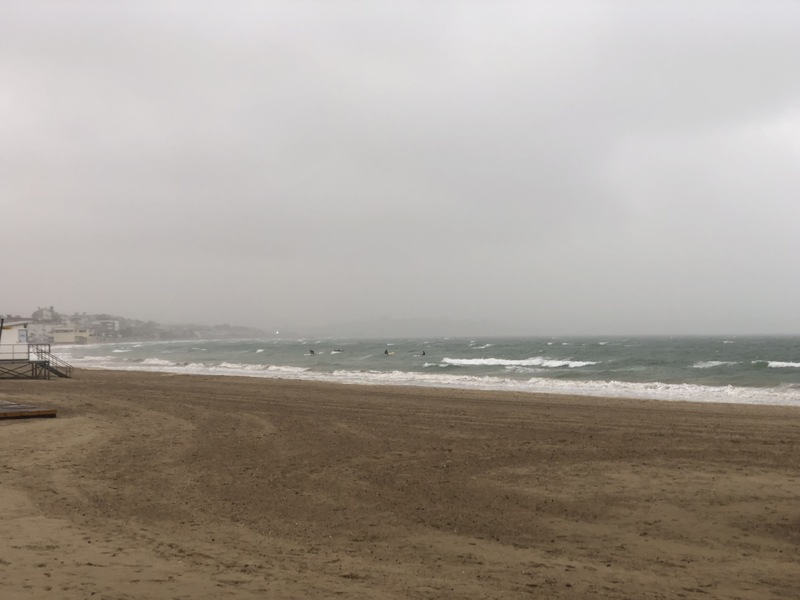 Right on cue, the weather came in… as the clothes I was wearing were the ones I was going to be putting back on at the end, I elected to get changed into my wetsuit (it being somewhat waterproof and fairly warm!). I was fortunate enough to find a toilet that I don’t thing was intended for athletes so was able to shelter for a while in the dry. Then came an announcement… due to the weather and water conditions, not just now but what was being forecast, Ironman had taken the decision to shorten the swim to 950m and to delay the swim start until 7:30am for us age groupers. Joy. 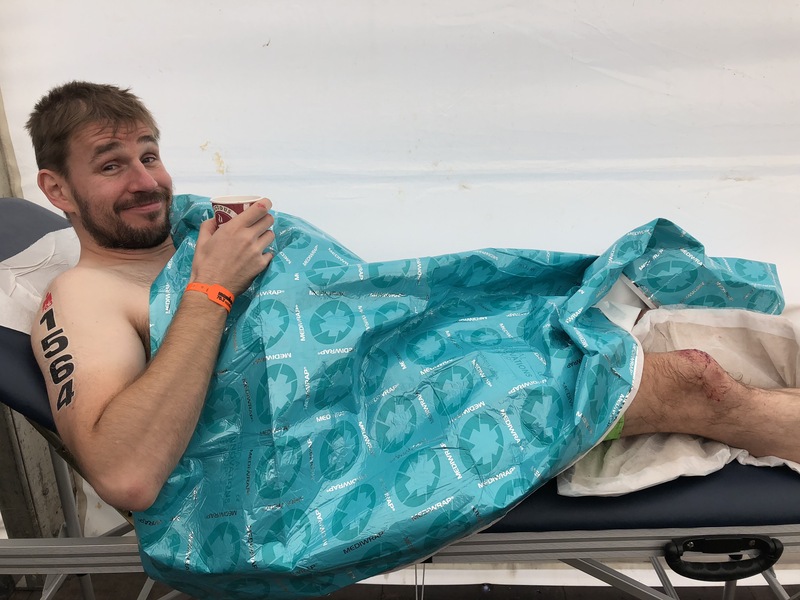 I stayed where I was as long as possible and then went and, ironically, joined a queue to go to the toilet… then I took my place in the swim queue and relished in what was to come. Large waves and big swells were the order of the day! Watching the pro men set off it looked pedestrian. Either the swim was not 950m or everyone was really struggling… the fastest of the pro men were around the 15 minute mark, which is pedestrian by their standards. We all slowly inched our way forward and when it was my turn to go, the reality of what was ahead made last year look lovely and calm. Oh good! Once I was in, it was every bit as bad as it looked. The waves weren’t as choppy as last year but they were a lot bigger, once you swam over one there was a huge swell behind it and a strong current pushing you back towards shore. Sighting was a problem and swimming straight (something I’m normally good at) was nigh on impossible. I was all over the place. I was looking forward to the first buoy as I hoped it would mean it would be easier. Nope. Still horrid, now I was battling to make the next buoy as I was being pummelled from the side and pushed toward shore. It only got easier when I turned the next one as at least the current was now taking me where I wanted to go! I certainly wasn’t surprised with my time, but it did make me think it can’t have been 950m… I was not far off the times I had been doing for 1500m earlier this year! Transition was a tad on the slow side as I elected to put on my calf guards (I’ve stopped swimming in them as I get cramp during and after). I was thankful for the gilet but as alluded to above I wish i’d packed more… it wasn’t a quick time, but in this weather there was more sense in being careful. Out onto the bike, it immediately became clear that the weather was with us for the long haul. It was heavy, persistent, horizontal rain. And it was cold. The first few miles are along the sea front and then heading north, towards a nice little leg warming hill early on. Heading along the front I saw 3 people heading back, I’m not sure if they were going back for more gear, or abandoning. I could understand either! I was making good progress, I wasn’t all out as it was so cold, visibility was poor and I was being cautious. The first climb is a good one, it warms your legs up; it’s not too steep, not too long but it’s tough. However, today, it was wet, grim and crowded. I’m rarely the quickest up hills on my TT bike as coach wants me to stay in a certain heart rate/power zone. This time i was passing people who were clearly struggling in the conditions. As is law, what goes up must come down, and the first descent was a delicate affair – this was my first foray into wet braking with carbon brakes and after the initial ‘nothingness’ I was pleased how well they bit. Again though, I was all about getting through the descents, not necessarily breaking any records! Whilst I could go on in great detail about the weather and the rest of the bike. In summary, it was cold, bitterly cold. 7 degrees celsius with 40+mph winds is not fun, absolutely the worst conditions I’ve ever been in on a bike. I had removed the visor from my helmet as I simply couldn’t see. I had resorted to banging the tip of my aerobars to change gear with the eTap Clics as it was taking several attempts to use the thumb shifters on the bull bars. My core was warm thanks to the gilet and I was glad I packed it, but I wish I’d taken more as I was shivering on the bike. I was averaging a decent speed, slightly slower than last year but the first 2/3 of the course are a steady uphill. I was pleased that I was passing people and things were going well. I was over half way, feeling great in my legs, strong even. My nutrition had been going well. I approached an innocent 90 degree left hand, and was just passing another athlete. As we went through the corner I was on her right hand side accelerating, I was on the bull bars as I had braked through the corner. I went to shift down on the bull bar as there was a small climb and somehow my hand slipped off the bar. What happened next is unclear. I tried to regain control but obviously slowed. Whether I was clipped from behind or just lost control I still do not know. Either way, I was heading for a kerb stone, doing 20+ mph and not in control. I hit the ground hard, i’ve no recollection of what hit first, or how. Thankfully I didn’t hit my head or lose consciousness but it was pretty clear, very quickly, that my race was over. My knee was in a bad way and I could feel pain elsewhere. A few riders went passed and asked if I was ok; thank you for the good spirited nature all of you. A spectator came over to ask if I wanted to go and sit in his van to keep warm, then turned around fairly promptly and got a police woman to come and see me – thanks to you, whoever you were! I later learned that the police woman who arrived was a motorcyclist, called Lyn, I managed to get in touch with her later via Facebook after asking Ironman to try and find out who she was. To her, I will be eternally grateful. To say she went above and beyond is an understatement; she assessed me quickly and arranged an ambulance. She found blankets to wrap around me to keep me warm (I was convulsing with the cold/pain at this point – pretty sure hyperthermia was on its way!) She got me hot, sweet drinks and somehow even stumbled across a doctor who was spectating just around the corner! The real winner for me though was when she lay down on the floor next to me and cuddled me in my blanket cocoon to try and keep me warm whilst we waited for the ambulance. Thank you Lyn! During my trip in the ambulance I had 3 main worries; Is my bike ok, am I ok, Is my wife going to kill me. The last one worried me the most. I had given her details to both Lyn and the ambulance but wasn’t sure if she knew yet. I assumed that I’d have disappeared from the tracker but that didn’t explain what had happened, I knew she’d be waiting for me at T2… in a strange twist of fate, when we arrived at the medical tent I recognised Emily, another athlete who Steve coaches, she was waiting for her partner who had also had an accident on the bike. Thanks to the power of social media, even though I’d never met her, I recognised her and was able to reel of my wife’s number (apparently the fact I knew this surprised a lot of people!?) and get her to contact her for me. I was put on a stretcher and checked over by a few people. Given a few more hot sweet drinks and some strong painkillers. Went to the loo several times (hydration had clearly been on point!) Eventually Hayley arrived and that was when I could shed a little tear about what had happened. Thankfully she wasn’t too mad at me, mostly she had been concerned about me and had been grateful that Emily had got in touch – second big shout out of the post to Emily!! Not the finish I had in mind…. Not quite what we planned… swollen much?? 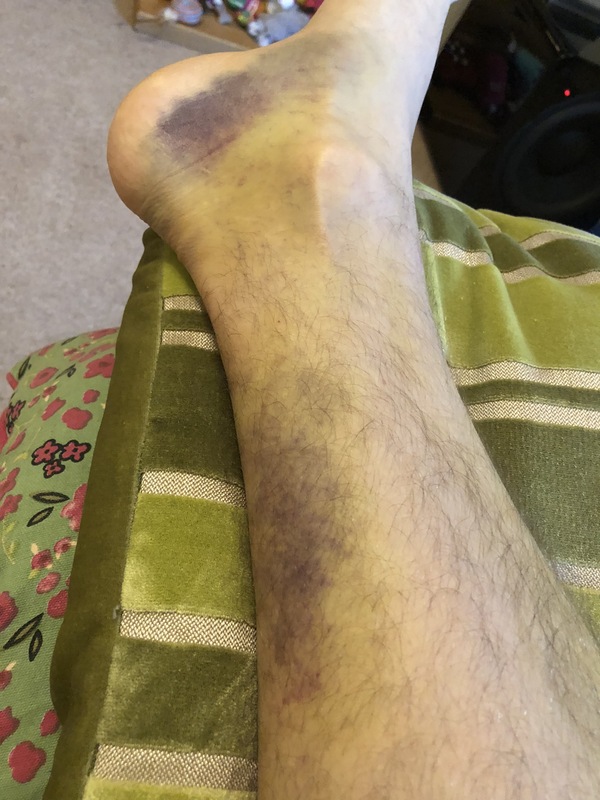 Now I’m no doctor (but an actual one confirmed) that it isn’t supposed to look like this…. they cleaned all of my hands, shins and ankles but whenever they tried to do the knee I was wincing in pain. A few more people came to check me over and they were concerned that I may have broken something so wanted an X-ray in order to rule it out. 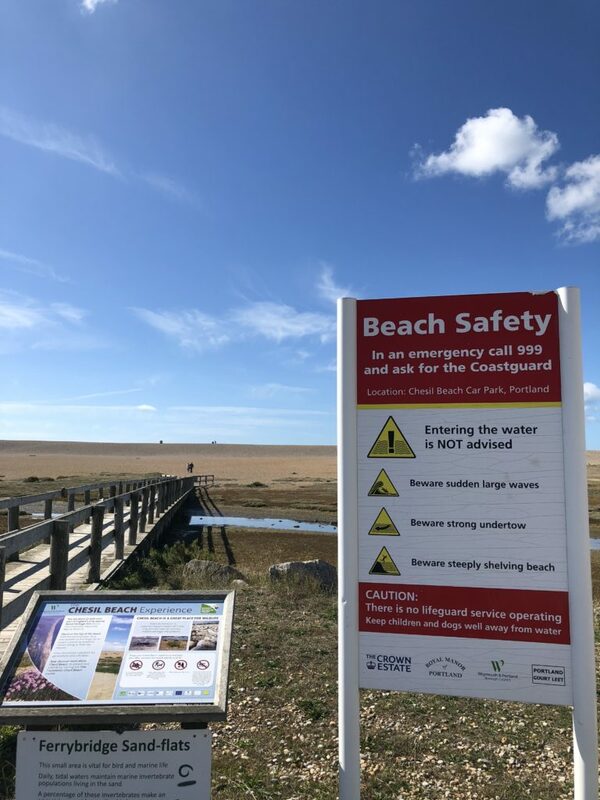 This took a bit of time to arrange due to road closures – jeez, who’d organise a massive triathlon when some of us needed to get to hospital!! Eventually I was bundled into my second ambulance of the day, Hayley trekked back to the hotel to get the car to come and meet me at the hospital. Can I still hop over the line? I’m not sure if it’s because of how I arrived (apparently I was the first person from the race to go to hospital – does that count as a victory??) but I was seen immediately. 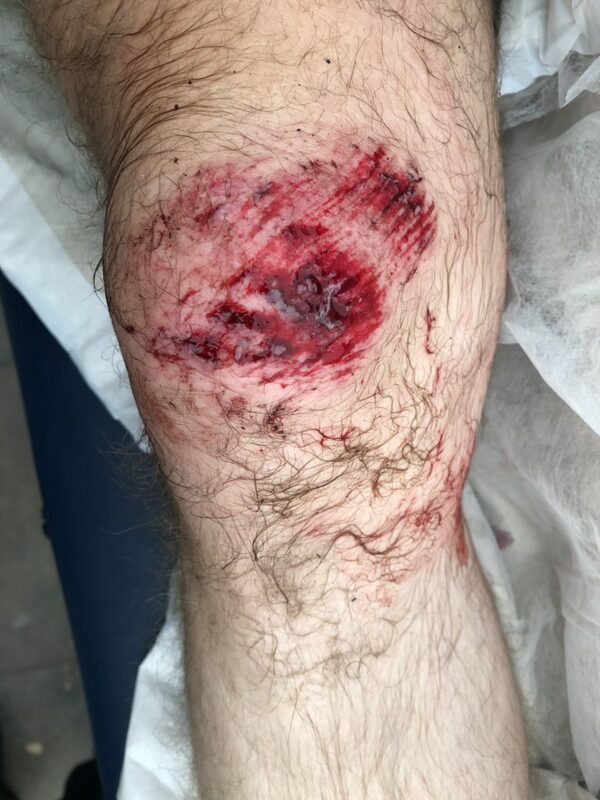 Seriously, I was out within an hour having been assessed, X-rayed, confirmed I hadn’t broken anything (Hayley arrived as they were checking the X-ray and agreed my knee looked ok) and had my wound cleaned (wow, that hurt) and was on my way! With all that said, in summary, not the race I had planned. At all. Hindsight is everything. I genuinely believe that a pair of gloves would have made all the difference, as no matter how I actually came off, I am certain it was down to a loss of feeling in my hands. I’m writing this a few weeks later as it’s taken me some time to feel up to it. I’m still limping along, I’ve had another visit to A&E as I was concerned I may have had DVT. I’ve been to the doctors twice only to be told that there is still too much swelling for them to examine me any further, and lots of blood pooling too! Currently I’m managing pain with strong painkillers and anti inflammatories and not thinking about racing at all – which to me makes me feel pretty sure that my body is definitely still in healing mode. I’m hopeful for an MRI soon so they can tell me what I’ve done and we can start a full recovery programme. Clearly it’s going to be some time before I’m training though… which isn’t good news as my muscles are wasting away!! Thanks again to all those that helped; Lyn, Emily and Hayley especially. And thanks to Ironman too, people moan about the costs of entering these races. Having now seen ‘behind the scenes’ a little… it’s worth every penny. Oh and one final note, this was the weather the next day…. The day after Ironman 70.3 Weymouth… lovely weather! Probably should’ve taken some of that safety advice on board yesterday…. I went into my winter training block with a new aim, to get fit and healthy so I could start the new year on the right foot. This went well, training times looked good, I felt strong, I smashed my 100 and 200m Swim PB’s on Christmas Eve… then the wheels fell off completely. During a ride on New Years Day I felt weak. The next day I felt a bit flu like. Thankfully it seemed to clear up pretty quickly so I only lost a few days training. Sadly, 3 weeks later it was back, with a vengeance. I ended up taking time of work, something I rarely do. I went through many stages of chest infection that culminated in my childhood asthma being declared back. In total I lost 11 weeks during which I did nothing, I couldn’t, walking briskly was an effort that had me wheezing. Staffs was chosen due to the locality but it was more of a faff this year then 2 years ago. The split transition was even more split with a 2 mile walk from the recommended car park to registration! Sadly, the registration faff was the most memorable part, my promising performances in the shorter races proved that whilst I hadn’t lost my speed, my endurance had definitely suffered. The swim was ok, but nothing more. The bike was going great until 35 miles where suddenly I felt weak, unfortunately this coincided with the arrival of all the hills in Cannock Chase. I started the run feeling ok and the first few miles were right on pace, then a combination of a recurring foot injury, heat, horrid twisty course and nutrition issues (I dropped my own and the on course stuff was grim!) meant a terrible result. Thankfully I was able to dig deep within myself and a combination of thoughts of “if i can finish the half marathon in under 2 hours I should bet my previous time” and also that I saw a fellow coached athlete and was determined to not be beaten by him! Meant that despite it being an entirely forgettable race I did beat my time from 2 years prior by a few minutes.